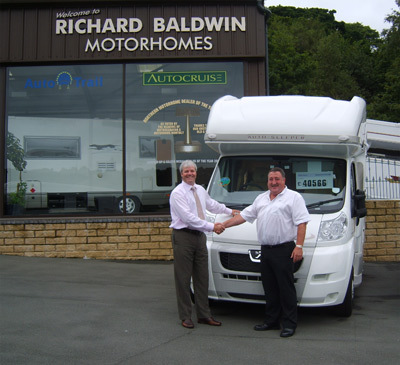 Multi award winning dealer Richard Baldwin Motorhomes is delighted to announce that the business has now completed its transfer from sole trader into a Limited Liability Partnership (LLP). Gary Morgan, who joined the company in June 2008 as Managing Director will become a Partner alongside Richard Baldwin and he is said to be delighted that the new LLP is now up and running. Gary commented on the fact that though a couple of notable Motorhome businesses have been through either a name change or a status change recently, under what could be described as dubious circumstances, the change that we have made was solely for the purpose of me becoming a shareholder, which simply could not have happened when Richard was a sole trader. The business has a steady but strategic growth plan that the Partners have both agreed to and they are optimistic that they will be able to see the business go from strength to strength, but at the same time still managing to keep that personal touch that has been the back bone of the success of this family business up to date.